The foundation of any reliable Point-of-Sale (PoS) system is to supply accurate and consistent pricing every time a customer returns to your store. Familiarity breeds trust-worthiness. Unlimited price lists. Dedicate a price list to unique customers. ‘Freeflow’ feature allows you to describe and price on the fly. ‘No Value’ feature caters for that tailoring repair charge or cleaning item that cannot priced at the counter. We guarantee that it won’t be missed. Unlimited upcharges and item descriptions are easily allowed for. Memo messages can be personalised for specific customers.ertips. With DCCS, you can attach a standard message or create your own using our Ticket Note feature. Memo messages can be permanently setup by account to appear on the screen and/or print on the Ticket to reflect specific customer preferences. Fabric disclaimers can be assigned to those items that may be at risk during the cleaning process. Coupons and Discounts can be restricted to application at Ticket Writing only, and/or later on at Pickup. You can apply dollars off, percentages and assign an expiration date. 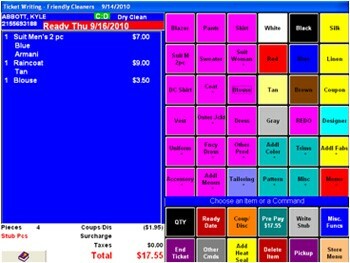 DCCS Bar coded coupon program allows you to automatically issue coupons based upon sales volume or customer visits. Management reports let you know the effectiveness of the campaign so you can make better informed decisions about future promotions.